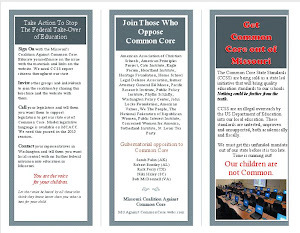 Missouri Education Watchdog: Common Core. A Rigorous or a Worksheet Education? 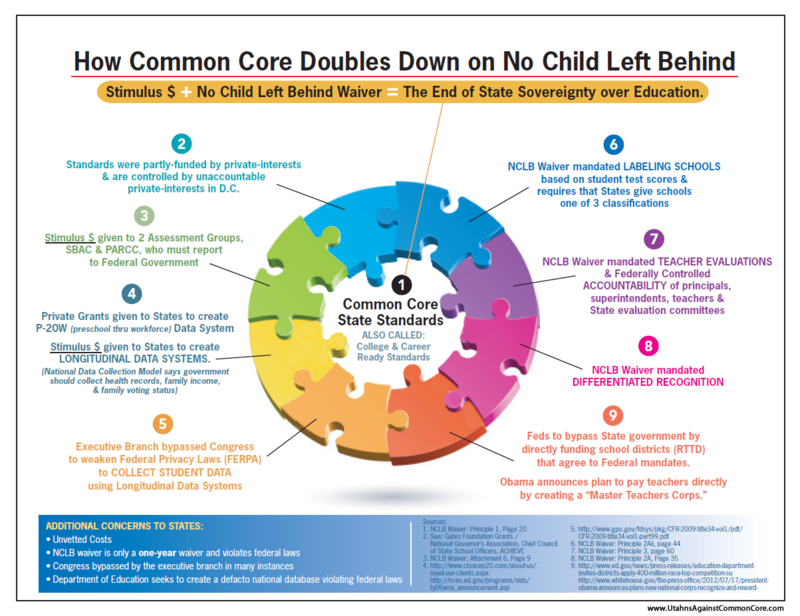 In the legislative hearings for MO SB 210 and HB 616, Common Core proponents insisted the new standards and assessments were rigorous. Over the next several days, we will be providing examples of Pearson designed CCSS assessments for your review and you can get a hint of what is ahead for your child in Missouri. The state of New York has implemented CCSS in many schools and you will be seeing actual examples of what we assume the Missouri CCSS proponents would classify as rigor in the classroom. Are these CCSS aligned examples indicative of the type of rigor that will result in authentic learning for students in Missouri? Does your child bring home exclusively worksheets? No creative or fun work in the take home folder? No challenging assignments? If so, your child could be receiving a "worksheet" education. What is a "worksheet education"? When a student only completes "fill in the blanks", multiple choice, and short answer questions during the school day (and homework) they are receiving a "worksheet education". Many of the these simple exercises are from corporate made workbooks or unit plans. These mass produced lessons do not challenge our children's curiosity or creativity. Why does a "worksheet education" occur? Some teachers will choose primarily worksheets for our children because it is a simple and easy way to plan and deliver their lessons. A worksheet education can happen if a teacher shows a lack of effort or creativity. This can also occur when a teacher is assigned a new grade level or course. It takes time to "build a course" with their own ideas and lessons. The major culprit that is contributing to the overuse of worksheets is the use of high-stakes testing to evaluate teachers. As most states have adopted the use of standardized assessments to judge educators, the pressure to raise test scores has increased. Teachers who fear low test results may engage in test preparation type work to ready students for the format and style of the state assessments. 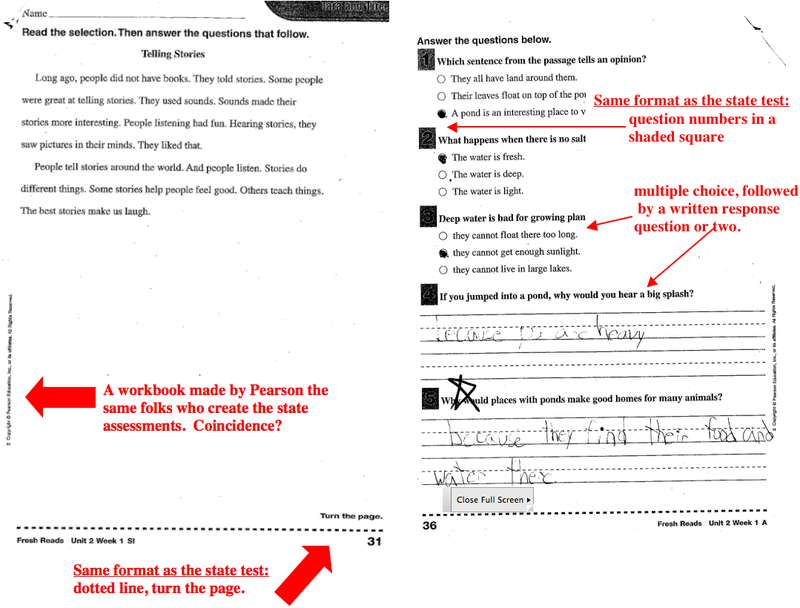 The recent adoption of the Common Core Learning Standards is a new factor in the "worksheet education" of some students. The Common Core has created a new curriculum for teachers to adjust their lesson planning. In New York the grade 3-8 state assessments this coming spring will be Common Core aligned even though many teachers have had limited training in the new curriculum standards. Starting from scratch with new content is a challenge for educators. In addition many districts have purchased workbooks for their staff to meet the new Common Core standards and teachers are expected to use these expensive programs. Increasing class size is also a factor in the "worksheet education" of our children. It is much easier to hand out busy work that only requires students to stare at a piece of paper instead of a creative project. It can be difficult for a teacher with a large class to plan, maintain order, and help students who are working on complex assignments and activities. What results from a "worksheet education"? Students could be receiving year-round test prep which limits your child's critical thinking skills and creativity. Students may be bored and exhibit behavioral problems as they get restless with the "drill and kill" nature of the test prep worksheets. Sadly, a generation of students may see the "worksheet education" they are receiving as a normal way to learn. Obedient kids will not complain and parents will think their children are happy and will be satisfied with their child's education despite the fact that their schools are operating in a test prep mode. 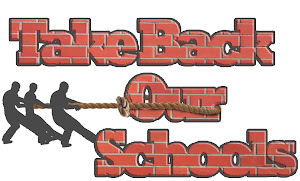 Think your child is safe because they are in primary grades or pre-K? No such luck, because of the new teacher evaluation systems, our youngest students could be attacked by the worksheet as well. If your kindergartener is bubbling in answers, it is time to raise the red flag. Some New York parents may recall their Regents Exam review books from "back in the day" and say "we did test prep and turned out fine". The old Regents review books were used only briefly towards the end of the year to cram and prepare for those high school exams. Imagine having to use that same type of dry and boring review style of learning for an entire school year, and then repeat again and again as you progress through school. The education of our children is at stake. The drive to raise test scores has harmed the average student's ability to think critically and be creative. In recent years I have noticed more and more of my middle school students excel at multiple choice and pulling basic facts from a reading, but ask them to analyze or think outside the box about what they have read and many students struggle. In an ELA test prep mode, you will see a short reading passage followed by several multiple choice and a couple short response questions. This is the exact format of the ELA exam. 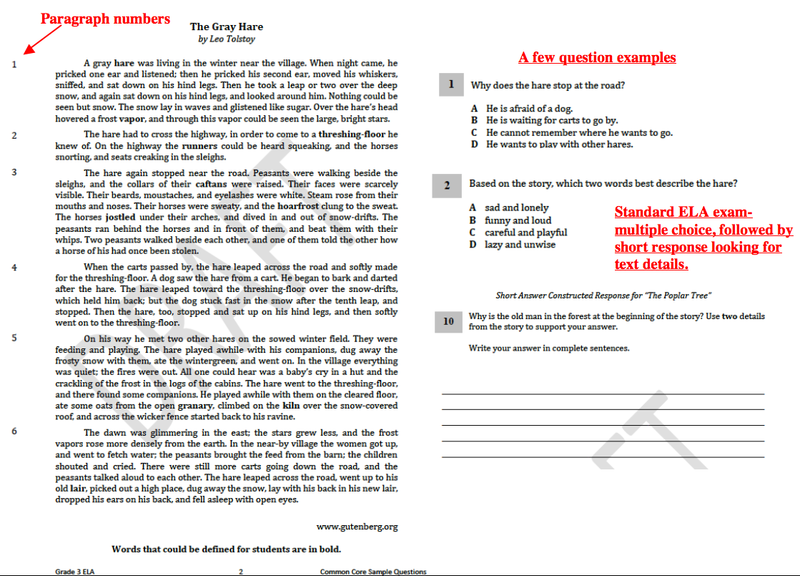 Students are drilled in this format to be able to grab the needed content items from the reading passage, but higher level thinking skills are rarely used. Time to talk to educators. Veteran teachers who know their students, grade levels and subjects can build their own lessons over time that are superior to the corporate produced test-prep workbooks that are starting to dominate classrooms. Parents, before complaining to your child's teacher, find out if some creative work stays at school to decorate the classroom or to display for special school events. 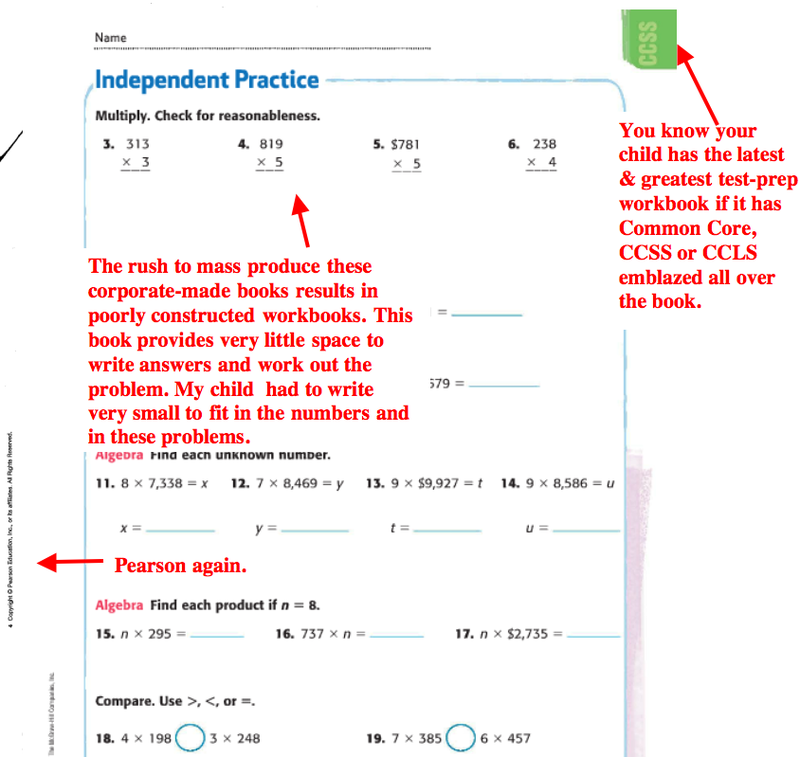 Ask your child's teacher if they are using workbooks mandated by the school. Significant sums of money are being spent for these test preparation books in a time of scarce financial resources. Some teachers may not want to use the workbooks, but feel as though they have no choice. If the books are mandated, then parents should question school administration as to why their child is receiving a test preparation curriculum. In New York, Pearson Education has a $32 million dollar contract to produce the state assessments. It is not a coincidence that Pearson also sells many of the workbooks that our schools use. Some have wondered why Pearson would get a $468.4 million contract from Texas, yet get significantly less from New York? Could the small compensation for its test construction in New York be a "loss-leader" for Pearson so it can sell educational materials, including curriculum packets and workbooks, to schools across the Empire State? Parents need to tell their schools that we expect more for our children. Let your school leaders and elected officials know that standardized test scores are not a measure of the quality of your schools, teachers or the progress of your child. Inform the school that you expect your child to get a well-rounded education that emphasizes high-order thinking, creativity and outside the box learning, not test preparation. Test preparation worksheets and books often mirror the format of the state exams. Example of my son's test prep worksheets. Second grade does not have a state assessment, but getting students prepared for the format and style is part of the test preparation, even at an early age. Note the short reading passage followed by multiple choice and short response. 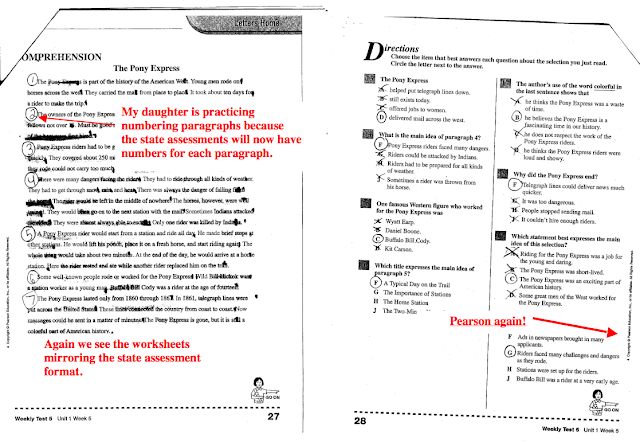 Fourth grade unit test from Pearson. Again notice the format is similar to the state assessment. 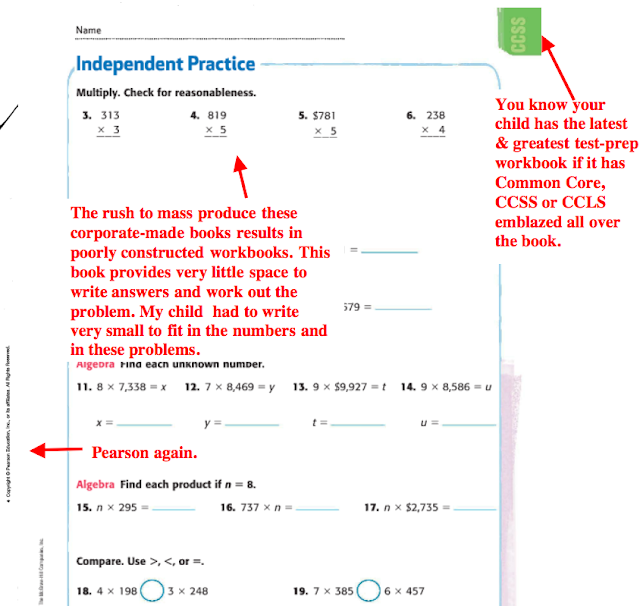 Fourth grade Common Core State Standards aligned math book.